Recently, various driving support systems have been developed to improve safety. However, because drivers occasionally feel that something is wrong, systems need to be designed based on information that drivers perceive. Therefore, we focused on optical flow, which is one of the visual information used by humans to improve driving feel. Humans are said to perceive the direction of self-motion from optical flow and also utilize it during driving. Applying the optical flow model to automatic steering systems, a human-oriented system might be able to be developed. In this paper, we derive the focus of expansion (FOE) in the frame of a camera that is the direction of self-motion in optical flow and propose a nonlinear control method based on the FOE. The effectiveness of the proposed method was verified through a vehicle simulation, and the results showed that the proposed method simulates human behavior. Based on these results, this approach may serve as a foundation of human-oriented system designs. Y. Okafuji, T. Fukao, and H. Inou, “Development of Automatic Steering System by Modeling Human Behavior Based on Optical Flow,” J. Robot. Mechatron., Vol.27, No.2, pp. 136-145, 2015. K. Yoshimoto, “Simulation of man-automobile system by the driver’s steering model with predictability,” Bulletin of the Japan Society of Mechanical Engineers, Vol.12, No.51, pp. 495-500, 1969. 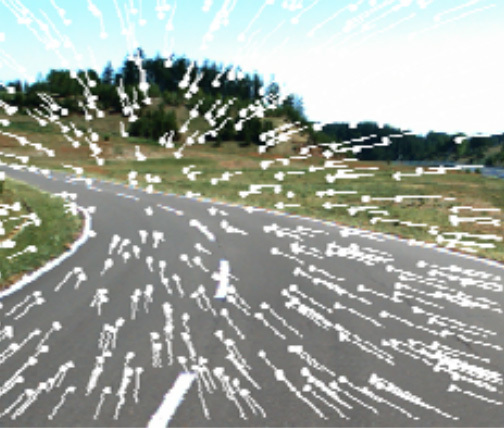 H. Inou and T. Fukao, “Modeling of driver steering operation based on optical flow,” Proc. of the Society of Automotive Engineers of Japan, pp. 1-6, 2013 (in Japanese). T. Kanade and T. Matsui, “Human, the weakest link,” J. of The Japanese Society for Artificial Intelligence, Vol.20, No.5, pp. 550-556, 2005 (in Japanese).
 . J. Gibson, “The Perception of the Visual World,” Houghton Mifflin, Boston, 1950. W. H. Warren and D. J. Hannon, “Direction of self-motion is perceived from optical flow,” Nature, Vol.336, No.162-163, 1988. W. H. Warren and D. J. Hannon, “Eye movements and optical flow,” J. of the Optical Society of America, Vol.A7, pp. 160-169, 1992. S. K. Rushton, J. M. Harris, M. R. Lloyd, and J. P. Wann, “Guidance of locomotion on foot uses perceived target location rather than optic flow,” Current Biology, Vol.8, No.21, pp. 1191-1194, 1998. J. P. Wann and M. F. Land, “Steering with or without the flow: is the retrieval of heading necessary?,” Trends in Cognitive Sciences, Vol.4, No.8, pp. 319-324, 2000. R. M. Wilkie and J. P. Wann, “Controlling steering and judging heading: retinal flow, visual direction, and extraretinal information,” J. of Experimental Psychology: Human Perception and Performance, Vol.29, No.2, pp. 363-378, 2003. J. P. Wann and M. F. Land, “How do we control high speed steering?,” Optic Flow and Beyond, Vol.324, pp. 401-419, 2004. C. S. Royden, “Analysis of misperceived observer motion during simulated eye rotations,” Vision Research, Vol.34, No.23, pp. 3215-3222, 1994. W. H. Warren, D. R. Mestre, A. W. Blackwell, and M. W. Morris, “Perception of circular heading from optical flow,” J. of Experimental Psychology: Human Perception and Performance, Vol.17, No.1, pp. 28-43, 1991. M. F. Land, “Does steering a car involve perception of the velocity flow field?,” in Motion Vision, Springer, Berlin, pp. 227-235, 2001. W. H. Warren, B. A. Kay, W. D. Duchon, and S. Sahuc, “Optic flow used to control human walking,” Nature Neuroscience, Vol.4, pp. 213-216, 2001. R. M. Wilkie and J. P. Wann, “Eye-movements aid the control of locomotion,” J. of Vision, Vol.3, pp. 677-684, 2003. R. M. Wilkie and J. P. Wann, “Judgements of path, not heading, guide locomotion,” J. of Experimental Psychology: Human Perception and Performance, Vol.32, No.1, pp. 88-96, 2006. M. F. Land and D. N. Lee, “Where we look when we steer,” Nature, Vol.369, pp. 742-744, 1994. M. F. Land and B. W. Tatler, “The visual strategy of a racing driver,” Current Biology, Vol.11, No.15, pp. 1215-1220, 2001. O. Lappi and E. Lehtonen, “Eye-movements in real curve driving: pursuit-like optokinesis in vehicle frame of reference, stability in an allocentric reference coordinate system,” J. of Eye Movement Research, Vol.6, No.4, pp. 1-13, 2013. H. Inou, T. Fukao, S. Totsuka, and Y. Okafuji, “Development of automatic steering control system based on optical flow model,” Int. Symposium on Advanced Vehicle Control, 2014. E. Malis, “Survey of vision-based control,” In ENSIETA European Naval Ship Design Short Course, 2002. F. Chaumette and S. Hutchinson, “Visual servo control I: Basic approaches,” Robotics and Automation Magazine, Vol.13, No.4, pp. 82-90, 2006. W. E. Green, P. Y. Oh, and G. Barrows, “Flying insect inspired vision for autonomous aerial robot maneuvers in near-earth environments,” IEEE Int. Conf. on Robotics and Automation, Vol.3, pp. 2347-235, 2004. [questa] P. Questa, E. Grossmann, and G. Sandini, “Camera self orientation and docking maneuver using normal flow,” SPIE’s 1995 Symposium on OE/Aerospace Sensing and Dual Use Photonics, pp. 274-283, 1995. R. N. Jazar, “Vehicle Dynamics: Theory and Application,” Springer, Berlin, 2009. G. Farneback, “Two-frame motion estimation based on polynomial expansion,” Scandinavian Conf. on Image Analysis, 2000. C. C. Macadam, “Understanding and modeling the human driver,” Vehicle Systems Dynamics, Vol.40, No.1-3, pp. 101-134, 2003.